The CSEJLE’s primary goal is to enhance and support STEM education in all Jewish learning environments. “There is a need among those committed to education in Jewish learning environments to connect and grow in STEM-specific capacities,” said Rabbi Mitchel Malkus, Head of School. Charles E. Smith Jewish Day School (CESJDS) is thrilled to announce the launch of The Center for STEM Education in Jewish Learning Environments (CSEJLE). 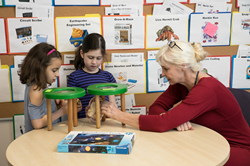 CSEJLE’s primary goal is to enhance and support STEM education in all Jewish learning environments including day schools, religious schools, camps, community centers, after school programs, preschools, clubs, and other places where Jewish children and families come to learn. -To create a community for educators in Jewish learning environments and others interested in STEM education to learn, share ideas, access educational resources, and connect. -To establish and serve as a platform for illuminating the needs and opportunities of the global Jewish community for STEM education. -To articulate and demonstrate that STEM and Jewish education may enrich and integrate with one another. As a home for teaching and learning, The Center will offer curricular ideas and program support, activity planning strategies, professional development, and program partnerships. CSEJLE will highlight member competitions, STEM enrichment events, and afterschool programs to the wider community. More information on CSEJLE will become available later in the fall of 2018. Visit http://www.cesjds.org/csejle for updates. CESJDS is the largest JK-12 independent Jewish day school in North America. Our mission is to engage students in an outstanding and inspiring general and Judaic education. CESJDS achieves academic excellence through an integrated curriculum that is anchored in Jewish values. For more information, http://www.cesjds.org.